The process of finding an electrical short in a car can be a tedious and time consuming task. There are several tools that you can use to make your task much easier. One is the use of a multimeter and the other is by the use of a test light. Open the hood and look for the battery. You might need a flashlight ​for this process. Hold the screw of the cable between the teeth of the wrench of the negative battery. Hold it firmly and then turn it in a counterclockwise movement. Loosen the screw. Detach the cable from the negative battery and separate the cable from the battery. ​Set the multimeter to display 10 amps. Make sure that the meter is positioned ​correctly, since this will affect how you position the short circuit. Find the position of the multimeter. The positive part - ​the red part - should be positioned on the negative side of the battery’s cable. The negative portion - ​the black part - should be positioned on the positive side of the battery. Observe the multimeter and record the reading. If the amp reads nil or 0, place the amperage at 9. Then check the multimeter reading again. Reduce the amperage scale by 1 each time you position the meter ​to check the ​reading. For instance, if the multimer reads at 0 again, reset it at 8 amperages and check it again. If you ​lower it all the way to 0 and the meter was not able to find a draw, then there is no sign of a short circuit. But, if it displays a draw, there is a short circuit. Make sure that the multimeter and the cables are in position. You can ask someone to detach the fuses ​while you hold the multimeter and the cables in place. 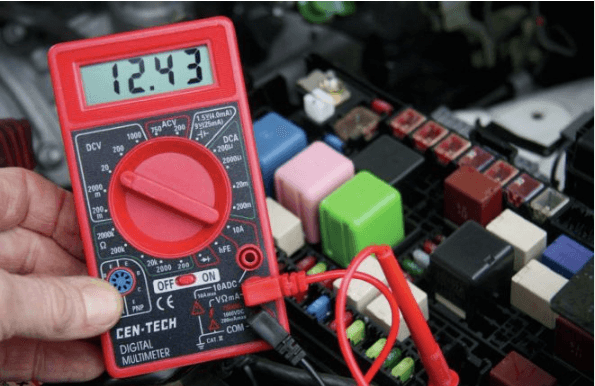 If ​the reading on the multimeter is at 0 after removing a fuse, determine which part that fuse is connected to – that is the location ​of the short circuit. Below are the steps on how to use an automotive test light. This information refers to all ​12-volt vehicles. To ​test the electrical power and the ground, this tool is easy to use and priced reasonably. You need to test the light first. Connect the clamp or clip to the ground - in this instance, the battery negative terminal is used, but any metal surface on your car will work. Carefully, touch the test light probe to ​any power source, like a positive battery or fuse. When the test light is grounded properly, it can be used to test the fuse. By touching both sides of the fuse, it confirms if there is ​at the fuse. If any of the accessories has failed - like ​brake lights - and the test fuse is okay, you can proceed with further testing ​like the brake light switch​. When performing these tests, it is best to use a wiring schematic. When the power tests are okay at the ​fuse or relay, but power is not present at one of the accessories like the cooling fan, a test light can n​arrow the problem down using ​the process of elimination. Power should be at the large terminal of the alternator when charging. A test light will carry out this job easily. The test light can be used in testing the power at the fuel injector. When ​checking the trigger side of the injector circuit, shift ​the clamp to the negative side of the battery. Finding the Short in Your Car! If you learn how to find a short in a car, ​you can save a lot. Finding and repairing a short circuit in your vehicle’s electrical system may cost you around $200 if you bring it ​to a car shop. However, if you purchase the specific tools needed - ​a multimeter ​normally costs ​around $40 - you can save ​around $100 plus.